Justin has only one set of living grandparents, and that’s on my side of the family, his lola and lolo whom he fondly calls Nanay and Tatay. Since Nanay and Tatay don’t live with us, Justin only gets to see them on special family occasions, like birthdays, Christmas, etc. or on those times we would ask them to look after our son while my husband and I would attend to other things. Here are my favorite photos of Justin with Nanay and Tatay. 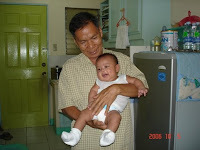 Three-month-old Justin with Tatay; Don’t they just adore each other? This entry was posted in Grandparents, Mommy Moments. Bookmark the permalink. Ang cute nman ng baby pics ni justin. aw swee tng mg alola anu? masarap magka grannies =) masuerte ang mga bata ng me lolo at lola salamat sa dalaw! i remember my kids when they were small, so mabait but now they’re big already, hirap hagilapin tuwing lunch time kasi nag lalaro pa.